In a search for possible pastels by Prince (see previous post), we corresponded in 2008 with the Prints and Drawings Department of the Museum of Fine Arts, Boston but came up empty-handed. if you have an hour to spare at any time when you are in Boston you will allow Prince to make some alterations in the Coppy he has taken from your Picture [by Copley] which he says he cannot do but from the life and Please to give him any direction you think proper as to the Dress of the Head. . . .
Did Prince also make a copy of the Copley portrait of Ralph Inman, a pastel now at the Boston Athenaeum? Might he have done portraits of Henry Barnes’s brothers-in-law, Nathaniel Coffin and Thomas Goldthwaite? 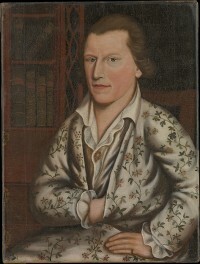 What is certain is, that, in February 1773, Prince signed and dated the portrait of William Duguid a Boston merchant (shown). Soon after, politics and escalating tensions terminated Christian Barnes’s enthusiastic support of her talented slave. In March 1776, Christian and Henry Barnes and their daughter Chrisy sailed for Bristol, England, never to return. Chrisy died of consumption in 1782. How ironic that Knox, whose own in-laws were loyalists, should be occupying a loyalist house! I shall inclose a line to Daphney to desire she would send my Chrisys Picture drawn by her Son, and must beg the favor of you to take charge of it, if Mrs. Forbes [Dorothy Murray Forbes] has parted with her Portrate, she will find upon her arrival the exact resemblance of it, hanging in my Parler dress’d in her white Satten Coat. Spurred on by Peck’s and Bagger’s discoveries, let’s hope that some of the works by Prince Demah (Barnes) described in the letters cited here will be found. 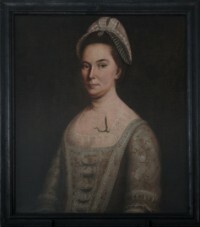 * “Portraitist and slave in colonial Boston,” in The Magazine Antiques, Jan/Feb. 2015, pp 154-59. ** Nina Moore Tiffany, ed. Letters of James Murray, Loyalist (Boston: Gregg Press, 1972), p. 251. *** The Magazine Antiques, p. 158. The quotations from Mrs Barnes are from the Papers of Mrs. Christian Barnes, Library of Congress, DM16.157. The portrait of William Duguid by Prince Demah can be found on the Hingham Heritage Museum website HERE. It is at the Metropolitan Museum of Art. Guest blogger, art historian, and an editor of In the Words of Women, Louise North writes about the black artist named Prince in this post and the one following. It is always a delight when new details or insights are discovered about the women we cared about deeply and presented in our book In the Words of Women, but especially if our past researches had come to a dead end. We wrote of loyalist Christian Arbuthnot Barnes and her outrage and fear as dissensions increased between her family and her neighbors in the late 1760s. Thanks to letters she wrote to her best friend Elizabeth Murray Campbell Smith, a successful Boston business woman (who was visiting England at the time), we learn how her husband Henry had been labeled an enemy to his country [Dec. 1769] and, six months later, how his effigy had been placed on a horse, which was let “loose about the Town, with an infamous Paper Pin’d to the Breast, which was sum’d up with wishing of us all in Hell.” Henry had been a merchant and dry goods importer in Marlborough, Massachusetts since 1753, had served as a magistrate, and was one of the largest taxpayers in the town. He also owned several slaves, among them Juliet and Daphney. fix’d in one corner of the room improving himself in the Art of Painting . . . . were I only to descant on the Qualifications of my Limner it would be a Subject for several Sheets. He is a most surprising instance of the force of natural Genius for without the least instruction or improvment he has taken several Faces which are thought to be very well done, he has taken a Coppy of my Picture which I think has more of my resemblance than Coplings [John S. Copley]. He is now taking his own face which I will certainly send you as it must be valued as a curiosity by any Friend you shall please to bestow it upon. We are at great loss for proper materials, at Present he has workd only with Crayons [pastels] and them very bad ones and we are so ignorant as not to know what they are to be laid on. He has hetherto used Blue Paper but I think something better may be found out. If you should meet in your Travils with any one who is a Proficient in the art I wish you would make some inquerys into these perticulas for people in general think Mr. Copling will not be willing to give him any instruction and you know there is nobody else in Boston that does any thing at the Business . . . intend to Exhibit him to the Publick and don’t doubt he will do Honour to the profession. You Laugh now and think this is one of Mr. Barnes Scheems, but you are quite mistaken it is intirely my own, and as it is the only one I ever ingag’d in I shall be greatly disapointed if it does not succeed. . . . as he was Born in our family he is of Tory Principles, but of that I am not quite so certain as he had not yet declar’d himself. Mrs. Barnes sent the pastel copy of herself to Mrs. Smith. More about Prince in the next post. The quoted passage can be found on page 215 of In the Words of Women. All other quotations from Mrs Barnes are from the Papers of Mrs. Christian Barnes, Library of Congress, DM16.157. The portrait of Christian Barnes is by Prince and can be found on the Hingham Heritage Museum website HERE.